If you are interested in news about Catherine, don't forget to check out her blog, Twitter and Facebook page! Keep checking back to this website for all the latest news about Catherine Gardiner and what she's working on! LINKS TO BUY FORGOTTEN (IN THE SHADOWS: BOOK ONE): Amazon UK, Amazon, Amazon Germany, Amazon France, Amazon Spain, Amazon Italy, Amazon Japan, Amazon Brazil, Amazon Canada, Amazon India and Amazon Mexico. Every so often, Catherine will hold a Q&A session where you can ask her all about writing! She will announce these Q&A's on her blog, but they will also be posted right here along with the latest news. Check out the Ask Cat page for more information. Big updates for Forgotten this month, and we hope it will have been worth the wait! Catherine loved her original book design, but after a great deal of thought it was thought best to change it so that it could better reflect the story. We'd like to give a huge thank you to Littera Designs for the amazing work they did on the new book cover! We'd also like to let all the readers that have enjoyed Forgotten that it has recently been updated. The main update can be found at the end of Chapter Twenty. To mark these changes, Forgotten will be on sale through the rest of the month and partly through October. Thank you to everyone for your continued support! At the time of this update, some countries are not displaying the Kindle sample. We hope this will be resolved soon. Thank you for your patience. We apologize for the lack of news recently, however, Catherine is working hard on future projects for all of her wonderful readers. We hope to have something more concrete to share with you in the next few months. Thanks for visiting! Catherine's debut novel is at an extended sale price. There isn't a better time to get it than right now! Available for: $1.09 at Amazon (up to $3.09 in certain countries outside of the US), £0.85 at Amazon UK, 0,99 € at Amazon Germany and Amazon France, 1,89 € at Amazon Spain and Amazon Italy, ¥ 102 at Amazon Japan, R$ 2,15 at Amazon Brazil and C$0.99 at Amazon Canada. With a new year comes a new price for Forgotten. If you haven't already you can pick up your copy at the links at the top of this page for: $4.59 at Amazon (up to $6.59 in certain countries outside of the US), £1.53 at Amazon UK, 2,68 € at Amazon Germany, 3,54 € at Amazon France, Amazon Spain and Amazon Italy, ¥ 409 at Amazon Japan, R$ 9,34 at Amazon Brazil and C$4.52 at Amazon Canada. 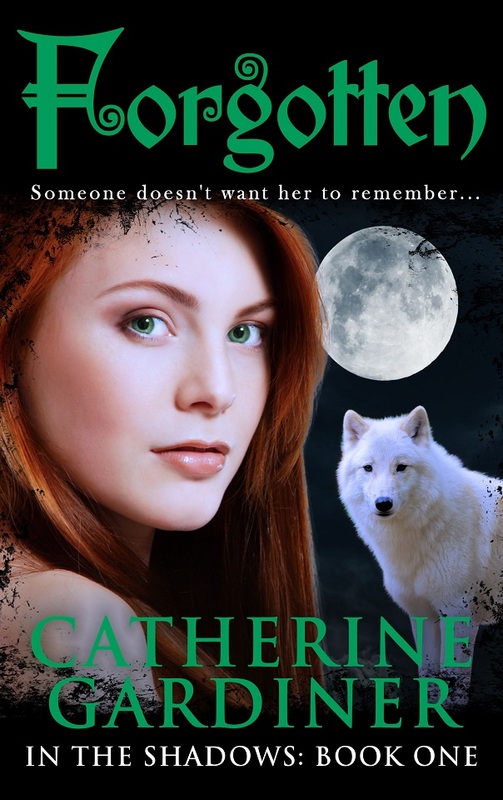 Alternatively, if you're an Amazon Prime member, you can download Catherine's book for free and keep it for a month (select countries only). Catherine hopes to be able to share news about the In The Shadows series in the coming months, but until then she wants to wish all her visitors and readers a very Happy New Year! Thank you for your continued support! Copyright (c) 2013 catherinegardiner.com. All rights reserved.